Go to our new CourseQuote page! Sie können uns auf Deutsch kontaktieren! …InTouch Language School, an independent institution, uniquely situated to be flexible and responsive to industry needs. 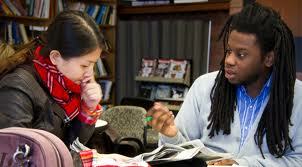 Our main activity is teaching English as a Foreign Language (EFL), but we offer courses in other languages as well. (See our Other languages that we teach page). …ACCREDITED WITH ETDPSETA, Registration number 2649, Accreditation number ETDP10895. This is a first in South Africa: an EFL centre with government-approved programmes to learn English on the National Qualifications Framework Levels 1-3 (CEFR A1-B1) with higher levels currently being evaluated. Of course you are welcome to do non-accredited training too! …situated in Cape Town centre AND in a rural locality, where students can optimise study time and be involved in outdoor and development activities. Out of the city, you are safe, in a very peaceful environment, and close to nature. More time spent on serious study means accelerated language learning! Our Equestrian English option is unique in South Africa, and only one of a series of exciting specialisations (ESPP), among them English and Art and English and Consciousness. Study in the centre of Cape Town is for those who prefer the bustle of the city, and includes being close to a variety of restaurants and the vibrancy Cape Town is famous for. …UNIVERSAL: We understand the developing world as well as the developed world. Our materials, methods and approach combine to provide EFFECTIVE language learning that students can relate to. We are ideally equipped for intercultural communication and exchange, and also understand and cater for the educational needs of migrants in the African context. …INFORMED: We keep abreast of the latest linguistic research on additional language learning. Our trainers combine master’s degrees in applied linguistics and branded EFL teacher development to deliver tried and tested as well as INNOVATIVE training to individuals, groups and companies. …EXPERIENCED: Our trainers have travelled the world and honed their skills teaching languages, tourism, and cooking (among others!) in state schools, accredited institutions and among refugees and street children – in urban as well as rural jungles. …FLEXIBLE, VERSATILE and ADAPTABLE: We do not follow any one method slavishly and have access to the world’s best resources. As an independent institution we have the freedom to customise our basic programmes to suit your unique needs! We can teach in your mother tongue if necessary or required. Many students leave language schools disillusioned with the fact that they didn’t understand anything during the first few weeks – they come to us to complain! Although we can and DO do immersion streams, we offer something that few others do: we use the students’ mother tongues to explain concepts and assist in understanding. 4 Responses to Welcome to Guaranteed Language Learning at InTouch! Hello Rohi!. Sorry, only seeing this comment now. thanks for popping in and commenting. Where are you visiting from and is there anything we can do for you? Keep well! We are from Russia, we would like to come for holidays in South Africa from 20 of July till 27 of August. We have kids 15 years and 11 years and looking for courses or school for study and practice English. Also, they like horse riding and surfing. Could you offer something for us? Hello Olga! Thank you for your comment. Please write to me at heidi@intouchlanguageschool.com and tell me what else you’re doing during the holiday, or whether we can help you organise that. We can certainly offer you possibilities!